When and how did you start to make crafts from flatware? I started making spoonhandle rings in the summer of 1971 after I had seen one in an antique shop in Seattle, where I was living at the time. After selling a few at a garage sale, I continued by going to flea markets in the Salem, Oregon area. Since June of 1974, I've been selling every weekend at the Portland Saturday Market, a large outdoor craft market (open Saturday and Sunday, March thru Christmas) in Portland, Oregon. What material is used to make the spooncrafts? I craft my creations from many types of flatware including silverplate, solid brass, non–magnetic stainless steel, and sterling silver. It just depends on the individual creation. Where do you get your silverware? Some I buy from people who frequent my booth at Portland Saturday Market or other craft fairs. Also, friends who have second–hand stores and antique shops save up flatware for me to purchase on a regular basis. Of course, the internet has been a good source of raw material recently. Do you make all the spooncrafts yourself? Although I started out by myself, no one person could keep up with the demand and the new creations. Our children and some of their friends helped a lot as they were growing up. Eric, who followed our son home from college, has been working since 1990,and we have a small crew. They are invaluable to the business. I have old family silverware. Can you make something for me from them? Yes, I do this often. We have over 40 years experience crafting silverware,but sometimes it does strange things. We will treat yours with the utmost care, but cannot guarantee it won't break, chip, or crack. We charge 50% more than our catalog price for an item made with your silverware, due to the extra time it will take. For more information, give us a call or see us at a fair. I've seen crafts like yours in other parts of the country. Are they yours? Possibly. Our crafts have been featured in several national magazines and have been seen on network television. Although I don't have a corner on the spooncraft market, my crafts are sold to shops throughout the United States, and even worldwide. Spoonman Creations gives a quantity discount to those shops who register with us. If you want more information, give me a call and I'll send you our resale packet. Yes, we do not rent, sell, or give away the names on our mailing list. If you call us, our phone recorder is in a secure location and it is safe to leave your information on it. Your credit card number is only used for the products ordered and not kept on file. We treat your personal information with the respect we would want others to treat ours. We will ship within a week. Most items we have in stock or can be made within a couple of days. We use USPS as our normal shipping agent. It gets rather hectic around Halloween and Christmas,so please plan ahead. We don't have a mailing list. We tried for several years and found it took a lot of time and expense to let people know we were going to be at a fair in Seattle. We'd rather bend up silverware than sort through lists of names. Your jewelry looks so bright. What kind of polish do you use? I use a process called mass finishing. It involves tumbling parts in a barrel with small steel beads. It's similar to, though not exactly like, rock tumbling. 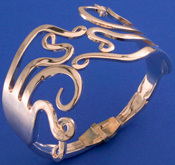 Any silver polish will keep your Spoonman Jewelry bright and shiny. Silverplate chimes, after hanging outside for years, will never be as bright and shiny as new. Another chime option is our 18–8 stainless steel chime. How many pieces of silverware do you use in a year? We usually cut up and use between 75,000 and 100,000 pieces of flatware yearly. Can I sell you my flatware? We are always buying non–magnetic silverware, both silverplated and stainless steel (no zinc please). We currently pay $0.40 each for stainless steel and $0.40 each for silverplate. If you are in the area of one of our fairs bring them by, or give us a call for shipping info. This year, we're being green and not mailing a paper catalog. If you can't find what you are looking for, use our contact us page for help. I really like your stuff. But I'm having trouble copying it. Will you help? We've been creating our products, learning tricks and refining our skills for over 40 years. Call us after you've tried for 40 years. We'll compare notes. What kind of drugs are you on when you dream these things up? We do this instead of drugs. It is a type of therapy.